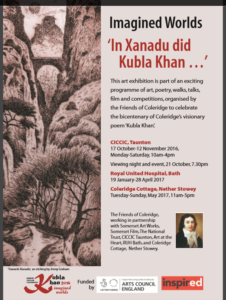 As part of the continuing programme of events celebrating the bicentenary of the publication of Samuel Taylor Coleridge’s visionary poem ‘Kubla Khan’, the Friends of Coleridge are delighted to invite you to visit our touring art, poetry, and film exhibition. The impressive and exciting art has been specially commissioned by Somerset Art Works on the theme of Imagined Worlds. The artworks, by established artists, will be on display at CICCIC in Taunton, from 17 October-12 November 2016, Tuesday-Saturday, 10am-4pm. You are very welcome to attend the viewing night and event on 21 October, 7.30pm. Entry is free. 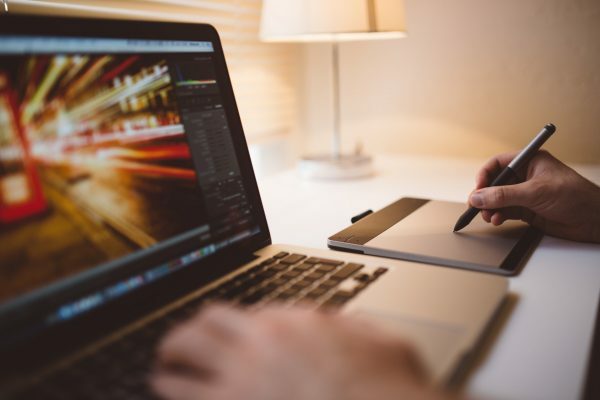 We will be presenting the awards for our national poetry competition, and showing a short film of a community performance of Coleridge’s poem, created by Somerset Film. There will be music, a taster of a new companion booklet to the poem written by Justin Shepherd, information about the programme of Coleridge-related walks, and a flavour of the Schools’ Workshops. The Friends of Coleridge are working in partnership with Somerset Art Works, Somerset Film, and the National Trust. Seamus Perry, Professor of English Literature at the University of Oxford, will be dis­cussing Coleridge and ‘Kubla Khan’ at the Museum of Somerset, Taunton, 13 October, 7.30pm.